Sweltering through the heatwave that recently descended on Brisbane, made me extremely grateful for the benefits of air conditioning. I started to wonder, not for the first time, how early migrants to Australia coped with the heat and humidity. Without electricity, they didn’t even have the benefits of fans, let alone air conditioning. Their clothing was designed more for colder climates than hot ones – think how you’d survive. I remember when I first arrived in Brisbane in the 1970s that the weather patterns were more regular than those we’re experiencing at the moment – there actually seemed to be a pattern to them. I arrived in August, the middle of a Brisbane Winter. But this Winter was heavenly, like the summer I’d left in England, but without the rain and cloudy grey skies. The light was brilliant and the sky was an incredible blue. Temperatures started to rise as we moved into summer. Storms would often blow up in the afternoons; after a relatively short and furious period of rain, the sun would come out again, everything would dry up and steam would rise from the roads. 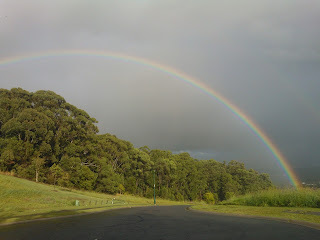 We might even have had a rainbow. My go-to site when the weather looks ominous is the Bureau of Meteorology at www.bom.gov.au. Watching storms track across the south-east based on data from the Mt Stapylton radar can either alarm or reassure me. Our ancestors would just look up in the sky and see what was on the horizon. A really bad storm involving hail could be indicated by the sky turning green or black. Tools such as weather vanes perched on rooftops would indicate the direction, and perhaps the strength, of the wind. The Old Farmer’s Almanac tells us that long before meteorologists had sophisticated technology to help them predict the weather, people observed what was happening in the sky, what animals were doing, and how nature changed. Many sayings related to weather came into popular usage – as children we used to chant: Red sky at night, shepherd’s delight; red sky in the morning, shepherd’s mourning.Another version, but one I’m not familiar with is Red sky at night, sailors delight. Red sky in morning, sailors take warning. The Almanac site is an American one, so some of the other weather sayings and their meanings didn’t resonate with me. 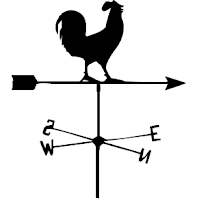 When writing your family history, have you researched what was happening weatherwise to see how it may have impacted on your ancestors’ activities. 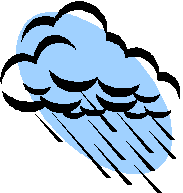 Apart from obvious reports of major weather events such as floods and cyclones which can fill many column inches of newspapers, many local papers carried regular reports of rainfall levels; drought conditions would also be reported so it would be worth checking our trusty friend Trove to see what you can find. 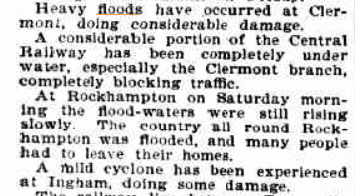 This extract from the Brisbane Courier of Wednesday 30 December 1896, page 4 provides a summary of events for that year including information on floods and droughts; the article also reports on the impact of pestilence, i.e. tick plague, on the quality of meat brought to market. Rabbits were apparently not quite such a problem as in previous years. Death rates from pneumonia, which presumably would be exacerbated by poor weather conditions, were high. Those living in towns would feel the effects of these events, but the impact on rural and regional Queenslanders would be even more keenly felt. In that year, Queenslanders living further away from Brisbane suffered from floods and a mini-cyclone. The Brisbane Courier of 3 February reported on heavy floods at Clermont, flood waters rising at Rockhampton and a mild cyclone at Ingham. I am currently researching events from the month and year of my birth for a Writing group activity (more on that next month) and was fascinated to learn from a History of the BBC that it revived regular TV weather forecasts in July 1949. These had been started just before World War II but abandoned during wartime. The forecast consisted of “charts with a disembodied voice reading the weather bulletin”. How different from today’s forecasts. Anyone who grew up or has lived in the UK would probably be familiar with the shipping forecast broadcast on BBC Radio. Many shipping region names, such as Viking, Forties, Cromarty, Dogger, Dover, came to mind as I cruised the North Sea on my way to and from the Baltic last July. I must admit though that I don’t know where all these are in relation to the UK coastline, although some are fairly obvious. So, Australia is indeed a place in the sun and all credit to early settlers who survived what the elements had to offer without the aid of modern technology. I wrote most of this blog post at GSQ, sitting directly below a ceiling fan. While this made life reasonably bearable, I was pleased to retire to one of the coolest, i.e. air-conditioned, rooms at home to finalise it!